And Justice for None is the seventh studio album by American heavy metal band Five Finger Death Punch. It was released on May 18, 2018, and was preceded by two singles released in December 2017 on their first greatest hits record. It is the last album to be released through Prospect Park and the last album to feature drummer Jeremy Spencer, who departed the band in December 2018. The band had already completed recording of the album by December 31, 2016. However, due to ongoing problems with their label Prospect Park, the album was delayed until 2018 after they reached negotiations with the label. After negotiations were reached in late 2017, they released the greatest hits compilation A Decade of Destruction and two new songs entitled "Trouble" and a cover of The Offspring song "Gone Away" recorded for the new album, were included on the compilation, with "Trouble" being featured on the deluxe version of the new album, which also features a different album cover than the standard edition. The album's title is a reference to Metallica's 1988 album ...And Justice for All. At the 2019 Bandit Rock Awards ceremony, it won Best International Album. Ivan Moody – vocals, piano on "Gone Away"
^ Janssen, Timothy (May 26, 2018). "'Five Finger Death Punch – And Justice for None". Grimmgent. Retrieved May 26, 2018. ^ a b c "Five Finger Death Punch // And Justice for None". Hysteria Mag. Retrieved May 18, 2018. ^ Munro, Scott (April 6, 2018). "Five Finger Death Punch release new single Fake". Metal Hammer. Retrieved April 7, 2018. ^ Munro, Scott (April 20, 2018). "Five Finger Death Punch hit back with new single Sham Pain". Louder. Retrieved April 24, 2018. ^ "New Song Premiere: Five Finger Death Punch's 'When The Seasons Change'". Blabbermouth.net. May 3, 2018. Retrieved May 5, 2018. ^ a b "And Justice for None by Five Finger Death Punch". ^ Hann, Michael (18 May 2018). "Five Finger Death Punch: And Justice for None review – single-minded angst rock". the Guardian. ^ "And Justice for None - FIVE FINGER DEATH PUNCH". 29 May 2018. ^ Grow, Kory (30 May 2018). "Recent Metal Releases: A Segmented Scene, But Its Power Remains the Same". ^ "Five Finger Death Punch – And Justice For None album review". 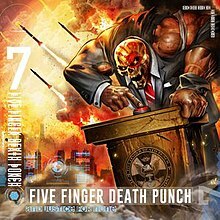 ^ "ALBUM REVIEW: And Justice For None - Five Finger Death Punch - Distorted Sound Magazine". 17 May 2018. ^ a b c "Five Finger Death Punch To Release 'And Justice For None' Album In May; Massive Summer Tour Announced". Blabbermouth.net. March 13, 2018. Retrieved March 13, 2018. ^ "Drummer JEREMY SPENCER Exits FIVE FINGER DEATH PUNCH". Blabbermouth.net. December 18, 2018. ^ Childers, Chad (March 13, 2018). "Five Finger Death Punch Confirm 'And Justice for None' New Album Details + Full Major Tour With Breaking Benjamin". Loudwire. ^ "VINNARNA I BANDIT ROCK AWARDS 2019!". Mynewsdesk. Retrieved February 23, 2019. ^ "Australiancharts.com – Five Finger Death Punch – And Justice for None". Hung Medien. Retrieved May 26, 2018. ^ "Austriancharts.at – Five Finger Death Punch – And Justice for None" (in German). Hung Medien. Retrieved May 31, 2018. ^ "Ultratop.be – Five Finger Death Punch – And Justice for None" (in Dutch). Hung Medien. Retrieved May 25, 2018. ^ "Ultratop.be – Five Finger Death Punch – And Justice for None" (in French). Hung Medien. Retrieved May 25, 2018. ^ "Five Finger Death Punch Chart History (Canadian Albums)". Billboard. Retrieved May 30, 2018. ^ "Hitlisten.NU – Album Top-40 Uge 21, 2018". Hitlisten. Retrieved May 30, 2018. ^ "Dutchcharts.nl – Five Finger Death Punch – And Justice for None" (in Dutch). Hung Medien. Retrieved May 26, 2018. ^ "Five Finger Death Punch: And Justice for None" (in Finnish). Musiikkituottajat – IFPI Finland. Retrieved May 27, 2018. ^ "Lescharts.com – Five Finger Death Punch – And Justice for None". Hung Medien. Retrieved May 30, 2018. ^ "Offiziellecharts.de – Five Finger Death Punch – And Justice for None" (in German). GfK Entertainment Charts. Retrieved May 25, 2018. ^ "Top 40 album DVD és válogatáslemez-lista – 2018. 21. hét" (in Hungarian). MAHASZ. Retrieved June 1, 2018. ^ "Irish Albums Chart: 25 May 2018". Irish Recorded Music Association. Retrieved May 26, 2018. ^ "Album – Classifica settimanale WK 21 (dal 2018-05-18 al 2018-05-24)" (in Italian). Federazione Industria Musicale Italiana. Retrieved May 26, 2018. ^ "アンド・ジャスティス・フォー・ナン(初回限定盤)" (in Japanese). Oricon ME inc. Retrieved January 20, 2019. ^ "NZ Top 40 Albums Chart". Recorded Music NZ. May 28, 2018. Retrieved May 25, 2018. ^ "VG-lista – Topp 40 Album uke 21, 2018". VG-lista. Retrieved May 25, 2018. ^ "Official Scottish Albums Chart Top 100". Official Charts Company. Retrieved May 26, 2018. ^ "Top 100 Albumes – Semana 21: del 18.5.2018 al 24.5.2018" (in Spanish). Productores de Música de España. Retrieved May 31, 2018. ^ "Sverigetopplistan – Sveriges Officiella Topplista". Sverigetopplistan. Retrieved May 25, 2018. Click on "Veckans albumlista". ^ "Swisscharts.com – Five Finger Death Punch – And Justice for None". Hung Medien. Retrieved May 30, 2018. ^ "Official Albums Chart Top 100". Official Charts Company. Retrieved May 26, 2018. ^ Caulfield, Keith (May 27, 2018). "BTS Earns First No. 1 Album on Billboard 200 Chart With 'Love Yourself: Tear'". Billboard. Retrieved May 28, 2018.